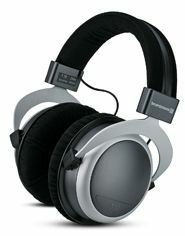 Beyerdynamic T70 review | What Hi-Fi? a suitably chunky carry-case, they don’t quite feel like £456-worth. Mind you, they do look nice and are exceptionally comfy. In many ways they’re also a delight to listen to, especially where vocals are concerned. Play Everything But The Girl’s version of Love Is Strange and the harmonised vocals are smooth, natural and detailed. There’s a nice tonal balance on display, too, with plenty of weight and depth in the bass and definition in the treble. The T70s aren’t perfect, though. Compared with the very best of their peers, they lack a little in terms of punch and dynamic drama, and that can leave tracks a little short of excitement – which is a real shame, especially at this price. Still, if you’re after a pair of comfortable closed-back cans, and you’ve got lots of money to spend, you certainly shouldn’t rule these Beyerdynamics out.